Planning a trip anytime soon? The first thing you should do is create an itinerary. 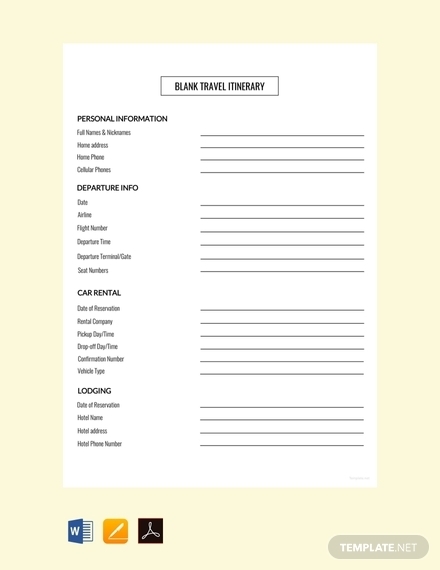 You may purchase your travel tickets ahead of time but you should also keep in mind that creating a travel itinerary should be on the top of your priority list. An itinerary is a requirement when you will be traveling as it provides with a guide or outline for the duration of your travel activity. In this article, we will be helping you create your own itinerary. 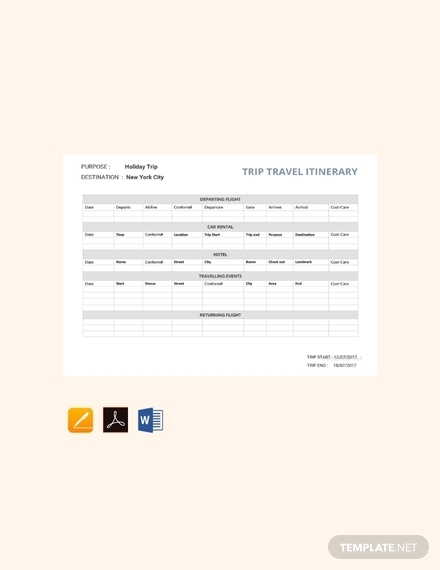 We have provided some examples that you can download for free as well simple tips for writing a detailed and highly useful itinerary. Read on below! 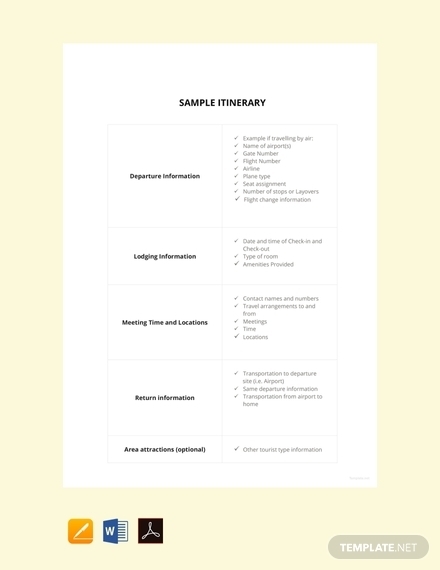 Listed below are the elements of an itinerary. 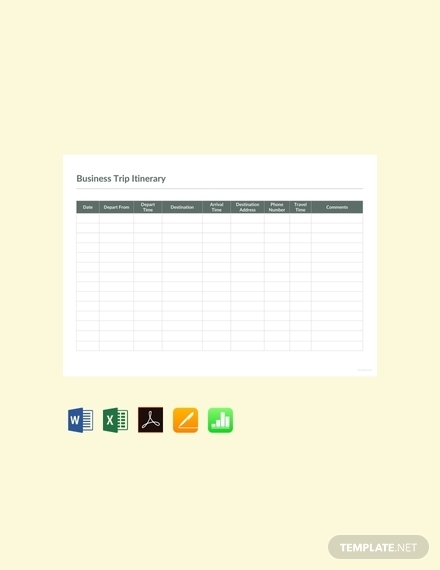 Make sure to include all the elements when you will be creating your own travel itinerary. 1. Program: The program involves all the activities you will be involved with during the trip. Program can pertain to every and any activity, so make sure to list every activity you will be doing during of the trip (including bathroom breaks, waiting for transportation to arrive, walking to a certain location, etc.). Making a program is essential as you want to maximize as well as enjoy your limited travel or leisure time. 2. Timetable: Unfortunately, there won’t be enough time to do everything in a day. The best you could do is to maximize the time that you do have to visit the places you want to go and carry out the activities you need to accomplish. Emergency situations and other unforeseen circumstances must also be accounted for when creating your timetable. Be sure to set time allowances between activities just in case. 3. Duration: Apart from setting a timetable, you also need to determine a time duration to stay at a particular place or to carry out an activity. That way, you won’t have to worry about running behind schedule. It is much better to finish an activity before the scheduled time period rather than hastily completing the activity in which you are already behind your intended schedule. 4. Destination: When traveling, never decide on the fly when going to a specific location. You will certainly waste precious time or (worse) you may not arrive at your intended destination. Plan beforehand the specific locations you want to go and how to get to each location or destination. You may also list down the address as well as the contact number of the said location. 5. Attraction, Accessibility, Accommodation, and Amenities: These are the four A’s that every first-time traveler should keep in mind. Creating a list of places you want to visit and things you want to do is extremely easy, but you still need to figure out how to get there, where to stay, and what you can do as soon as you arrive. Follow these simple tips so that you can create a detailed itinerary which will definitely help you in your travel activities. 2. Keep it organized: As previously mentioned, you don’t want to make decisions on the fly when creating details in your itinerary. 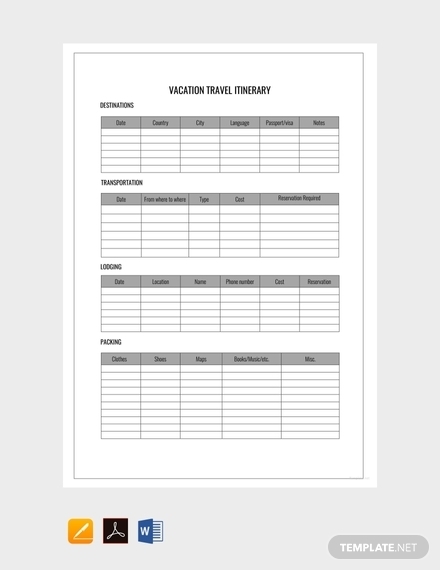 List down everything by program, timetable, and duration so that you won’t be confused especially when you will be traveling with a partner or with a group. Time is very limited when you are traveling, so keep everything organized. 3. Expect the unexpected: Regardless of how hard you try to stay on schedule, a few uncontrollable circumstances are bound to make an appearance during the most unexpected times. Though you can never really predict the weather or how the universe hopes to treat you that day, the least you can do is to keep your itinerary flexible for any changes that need to be made. 4. Make it brief and concise: Nobody has the patience to read through a lengthy wall of text, even if you are the one creating the travel itinerary. Even your readers will find it difficult to follow the itinerary if it’s very lengthy. So, try to limit your itinerary to one or two pages if necessary. You can always create two separate itineraries, one which is a summary and the other which is a lengthy version of the previous one. Refer to the detailed version of the itinerary if you will be looking into details regarding your travel activities. 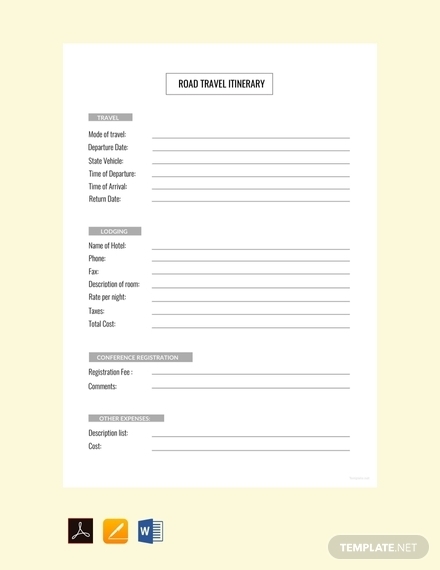 Follow these easy steps so that you can create the perfect itinerary for your next travel. 1. Do research: Research is key if you will be creating your own itinerary. Thanks to the internet, you won’t have to look far when doing research. Everything can be found online, and every source material is easily accessible. When doing research, watch videos, read blogs, and check websites for information and updates. You can also gather information regarding money-saving tips, as well as tips in regards to accommodation, food, and travel. 2. Prioritize items: It’s best to begin your itinerary with destinations that are closest to where you’re staying. Consider the time when it opens and closes, and determine other factors that should be considered before writing down items on the final plan. This is a clever strategy to use, as it can help you make the most out of each day of your trip. 3. Make a schedule: If you’re planning a trip that’ll last for more than a day, a daily schedule will come in handy. This should cover the exact time and place of each activity on your itinerary. Based on what you’ve gathered from your research, crucial factors such as peak hours or days must also be taken into account. Once you’ve settled these factors, plot down the necessary items on your schedule. 4. Finalize the plan: Review the plan for any discrepancies that need to be settled. If a problem arises, make sure to make quick adjustments so that you won’t waste time as well as money. 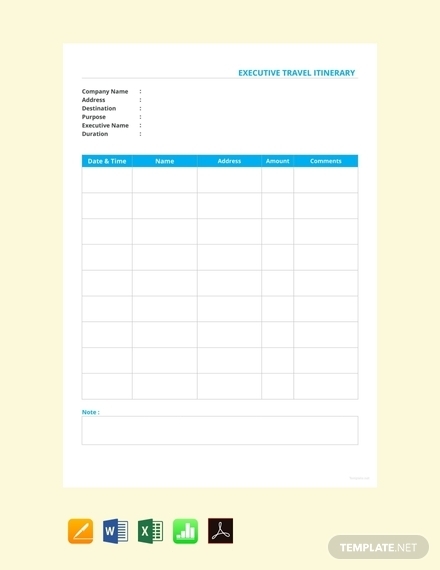 You can write the itinerary down on paper or secure a soft copy of the document on your phone for quick and easy access. Make sure to bring an extra copy of the itinerary in case the first gets lost. Listed below are the three general types of itineraries to suit your personal and/or professional needs. 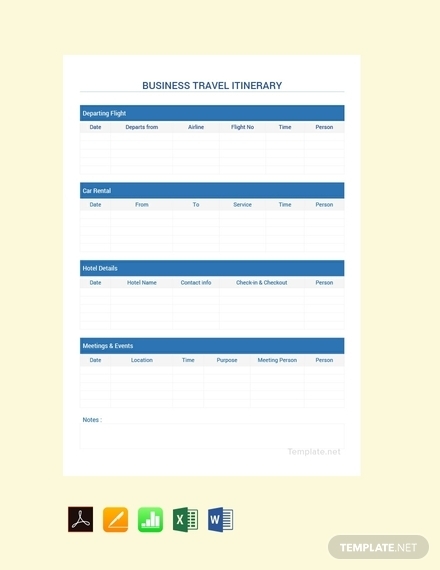 Business Itinerary: This type of itinerary covers the business agenda of a company employee or a group of workers. Given the duties that one is required to fulfill, sticking to schedule is a crucial task to follow. The document outlines all the activities that need to be carried out within the day in order to keep the concerned individual/s on track. Tourist Itinerary: A tourist itinerary is basically an itinerary for travel. Take note that you don’t have to go to a travel agency and pay for fees so that they can give you their own tourist itinerary. As previously mentioned, you have to take note of the location of your accommodation as well as the location of the tourist spots you will be going so that you won’t waste time and money when traveling. Tour Manager’s Itinerary: It’s important for the tour manager to have a copy of the client’s travel arrangements. This includes client names, flight details, hotel reservations, and contact information. These details must be specified clearly on paper to ensure that clients are taken care of during the entire duration of their trip. 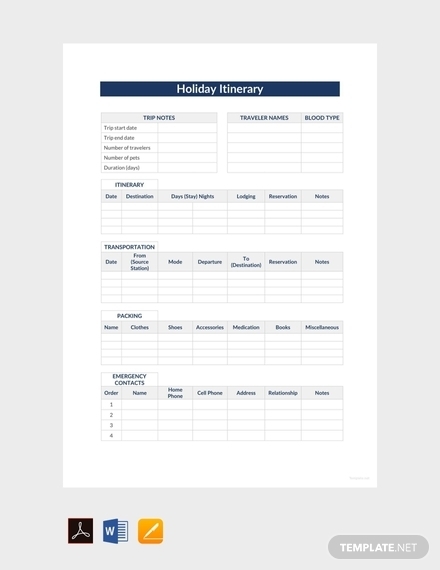 An itinerary is the first thing you should create before you go on that long-awaited adventure with family, friends, or just with your own company. We hope you found this article to be informative as well as helpful when you will be creating your own itinerary (in Google Docs). 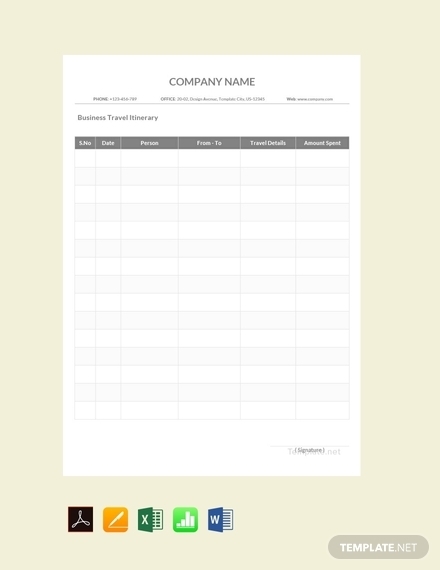 We also hoped you checked out the fully editable templates which you can download for free.